Just about every president has made a campaign promise that, once elected, he discovers he cannot fulfill. George H.W. Bush once proclaimed, “Read my lips: No new taxes.” Barack Obama pledged that he would reduce the annual cost of health-care premiums by $2,500. Taxes went up under Bush, and so did premiums under Obama. Voters never forgot it. Bush made his tax pledge in his nomination acceptance speech. Obama at least 19 times promised to reduce premiums, according to a video circulated by Republicans. Now President Trump faces a similar conundrum: He promised that Mexico would pay for his plan to build a wall along the southern border. But he did not make this promise just once or even two dozen times. From his announcement speech to the election, he declared 212 times that Mexico would pay for the wall, according to the comprehensive record of Trump’s speeches, interviews and tweets maintained by Factba.se. That works out to almost every two days during the campaign. Mexico refuses to pay for the wall, and Trump has engineered a government shutdown to try to force Congress to appropriate the necessary funds. Yet he insists that Mexico is paying for the wall because of a reworking of the North American Free Trade Agreement (NAFTA) that his administration negotiated — though it is not yet ratified by Congress. This is a nonsense claim. When the president first raised it in mid-December, we asked both the U.S. Trade Representative’s office and the Council of Economic Advisers for the economic analysis that justified his statement. The USTR would not respond to our queries, and the CEA said it was a matter for the White House press office. But the White House press office declined to respond. We initially decided that this claim could be easily handled in our database of Trump’s false and misleading claims (which now total 7,645). But now the president has asserted it at least five times in three weeks, suggesting it is a statement on its way to becoming a Bottomless Pinocchio. So let’s fact-check it. But first, let’s review how the president made his case during the campaign. When Trump was running for president, he was unequivocal: Mexico was paying for the wall, and he would guarantee it. He claimed that there were many ways the Mexicans could be forced to pay for it and that they would be “very happy” to do it. At one point, Trump was forced to release a plan for making Mexico pay for it. He first gave it to The Washington Post (you can read the memo here.) The basic idea: He would threaten to cut off the flow of billions of dollars that Mexican immigrants sent home unless Mexico immediately made a “one-time payment” of $5 billion to $10 billion. He also suggested other intimidation tactics, including increased trade tariffs, the cancellation of visas and higher fees for border-crossing cards. But the idea immediately came under attack for being probably illegal and likely unworkable. Trump never really pressed the idea, though he would often tell audiences that he had released a plan to force Mexico to pay for the wall. Trump also promised to have Mexico pay for the wall in the “Contract with the American Voter,” released with fanfare on Oct. 22. 2016: The wall would be built “with the understanding that the country of Mexico will be reimbursing the United States for the full cost of such wall,” said the document, which Trump signed. After Trump took the oath of office, however, the promise to make Mexico pay was quietly dropped. In his first conversation with then-Mexican President Enrique Peña Nieto, on Jan. 27, 2017 — The Post obtained the transcript — Trump admitted that he had a political problem of his own making. (Peña Nieto had canceled a trip to Washington after Trump had tweeted Jan. 26 that Mexico would pay for the wall.) He urged Peña Nieto not to make an issue of it. “The fact is we are both in a little bit of a political bind because I have to have Mexico pay for the wall — I have to,” Trump said. “I have been talking about it for a two-year period.” He pleaded with the Mexican president not to say that Mexico would not pay for it. “You cannot say that to the press. The press is going to go with that, and I cannot live with that,” Trump said. Trump agreed that if reporters asked about Mexico paying for the wall, he would try to avoid the issue by saying he was trying to work something out. After that, Trump’s references to Mexico paying for the wall dropped dramatically — fewer than 20 times over 23 months. It would come up from time to time, usually if reporters pressed him, but Trump would only vaguely explain how it might happen. During the campaign, Trump described getting money from Mexico for the wall and renegotiating NAFTA as two different tasks. But in early 2017, he suddenly said in an interview with the Wall Street Journal that they might be connected, as an “indirect” payment for the wall. Even then, Trump suggested there was some sort of account he would be building through alleged savings on trade. But that did not make much sense, and he never really pursued the idea again. Notice how Trump keeps moving the goal posts in a desperate effort to claim he’s keeping an unworkable campaign promise? Well, here’s why this latest claim is simply wrong. First, he premised this on money that the United States “saves” on the trade agreement. He’s already earned a Bottomless Pinocchio for saying the United States “loses” money on trade deficits. That is simply false. Countries do not “lose” money on trade deficits. A trade deficit simply means that people in one country are buying more goods from another country than people in the second country are buying from the first country. Trade deficits are also affected by macroeconomic factors, such as currencies, economic growth, and savings and investment rates. Trump’s deficit-financed tax cut and the Federal Reserve’s interest rate policy helped boost the trade deficit in 2018. So now he’s compounding one falsehood with another one. It’s worth noting that the trade deficit with Mexico has been climbing during the Trump presidency, so by his own (nonsensical) math, he’s already in deficit. Even if the trade deal results in a smaller trade deficit because Mexico is buying more goods from the United States, it does not necessarily translate into greater revenue for the U.S. government. NAFTA eliminated tariffs between Mexico and Canada, so there is no additional revenue to earn by somehow causing trade to increase with lower tariffs. The new United States-Mexico-Canada Agreement (USMCA) is actually a modest updating of the 25-year-old NAFTA. Some elements of the deal were borrowed from the Trans-Pacific Partnership, the trade deal Trump scrapped at the start of his term. One key change concerns autos, and it might end up raising prices for American consumers. Starting in 2020, to qualify for zero tariffs, a car or truck must have 75 percent of its components manufactured in Canada, Mexico or the United States, a substantial boost from the current 62.5 percent requirement. In theory, if automakers do not meet the requirement, there will be tariffs on cars, which would increase revenue. But that means Trump’s policy would have failed, because the whole point was to encourage more production in the United States. Moreover, the tariffs would essentially be a tax on American car buyers, who would pay higher prices. There’s nothing in the agreement that earmarks funds for the wall. And any revenue raised via tariffs (or some other source) still must be appropriated by Congress, which thus far has refused to fund Trump’s wall. But it’s still not true. 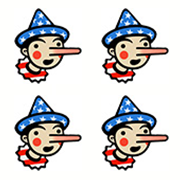 The president has already earned a Bottomless Pinocchio for claiming that the United States loses money on trade deficits. Now, he’s claiming that the “savings” from his trade deal will pay for the border wall. Given that the trade deficit depends on factors beyond a president’s control, this is yet another risky promise to make. The trade deficit with Mexico climbed in 2018. It may climb again in 2019. But even if the trade deficit declined, that would not translate into government revenue that could be claimed for the wall. Congress would still need to appropriate the necessary funds. It’s hard for any politician to admit they broke a campaign promise. But no amount of spinning and fuzzy math will obscure the fact that Trump made a promise that he cannot deliver. If he keeps making this claim, he’ll end up with a Bottomless Pinocchio — compounded. "The USMCA -- the new trade deal we have with Mexico and Canada -- what we save on that, just with Mexico, will pay for the wall many times."